When it comes to make a website for a business, an effective communication is essential. Your website should be universal, accessible to all, irrespective of browsers and devices. Until last year, businesses were using a separate mobile friendly website in sub-domain in order to cater the customers reaching to website via a mobile phone. However, things have changed now. With the uprise of responsive web designs, the concept of separate website for mobile browsers is vanishing quickly. 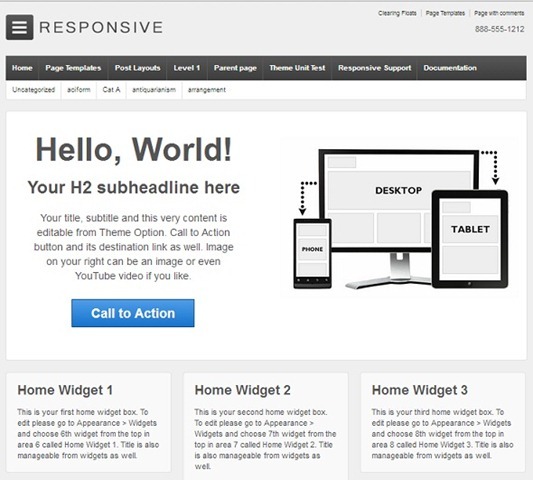 With this, the trend of responsive themes in WordPress has also gained a full throttle. A responsive theme adjusts itself according to the size of browser. Be it a computer, tablet or a mobile phone, if your website is responsive, it will resize itself according to the size of the device eliminating the need of a separate website for mobile devices. Recently search engines have also started emphasizing websites using responsive we designs as they don’t need to crawl the same content twice. With the increasing trend, WordPress community has witnessed a ton of responsive themes. However, theme requirements for a blog and a business portal are different. Here we handpick some of the free yet awesome responsive themes for your WordPress powered business website. 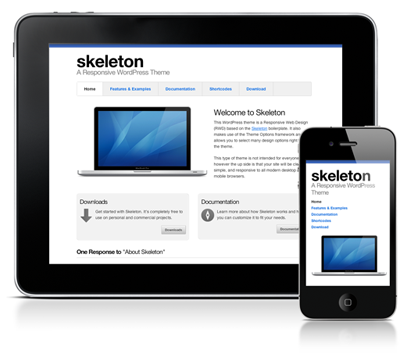 Skeleton is one of the best free responsive WordPress themes of 2013. It is a simple and lightweight responsive WordPress theme which aims at simplicity. The homepage of Skeleton is highly customizable and delivers a professional look with inbuilt cross-browser tabs on the front page. The theme works like a charm on mobile devices adjusting every thing seamlessly into a smaller browser. 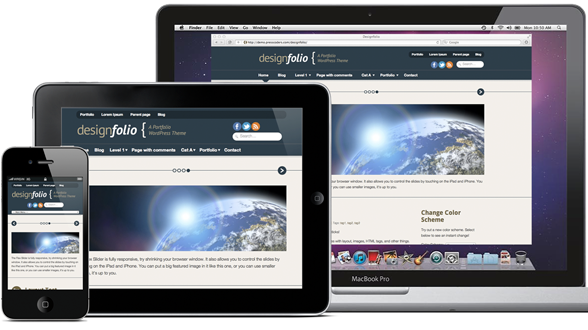 Designfolio is great when it comes to showcase a portfolio on your website. With a robust slideshow in the front, this theme features a sortable portfolio functionality to showcase your previous works. Whether you are a designer, artist or a real estate company, showcase your projects with ease with this free but awesome responsive theme. It offers 7 different color schemes and an extensive option panels to customize the theme as per your requirement. 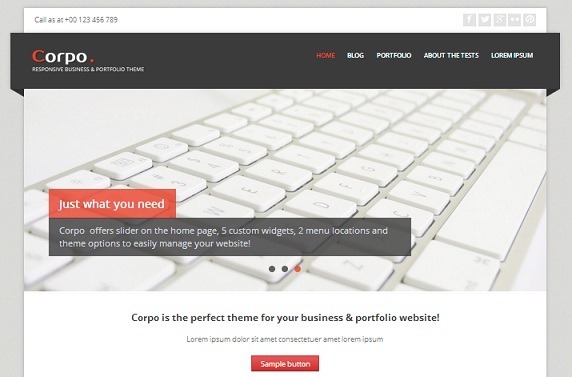 Corpo is another perfect responsive WordPress theme for your business website. It features a full width image slider with option to put your message in form of heading and content floating over the image. You can also showcase the services you provide, your previous projects, clients etc beautifully on the front page itself. A range of widgets help you display other essential information e.g. contact details, latest blog posts effectively. A clean and beautiful theme. The name says it all. Featured on WordPress, this theme is great for those who like a plain canvas to play around a lot. Though it sounds simple at the first look, but the theme is itself a robust platform to make an extensive website. Roam around the navigation and you would see a range of pre-ready page templates (with or without sidebar) and big call to action box on the front. However, you may need to play around with CSS to get rid of its plain look. A great theme if you want to communicate more through words rather than images. 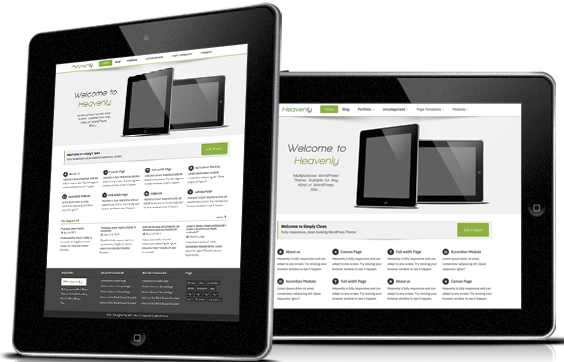 Heavenly lets you showcase a number of services, features and blog posts in an effective layout. While a separate portfolio page lets you showcase your recent projects effectively, you can ensure a regular interaction with your audience through the blog page. Did I miss a great theme? Do you know some better free WordPress responsive themes for business? Let us know through comments. It’s been very useful because it allows me to change fonts, font colors theme colors and a lot more. The problem is it’s not mobile responsive and I want to move on but have a theme that allows all the changes I’ve mentioned that can be done with Flexibility. Could you make any theme suggestions please. No theme will let you change as it is. But with a few tweaks, you can implement most of the changes in the new theme as well.